Open to all middle school girls in the tri-county area. T-shirt, lunch, and goodie bags included! Would you like to volunteer your time to help the next generation of girls get as excited about math, science, engineering, and technology as you are? Do you want to be part of building a diverse workplace for our future generations? Then join STEM-ING today! In order for our STEM event to be a success we need YOUR help! We are in need of volunteers for a full range of duties, including helping setup, run or assist in STEM workshops, guidance for students, etc. 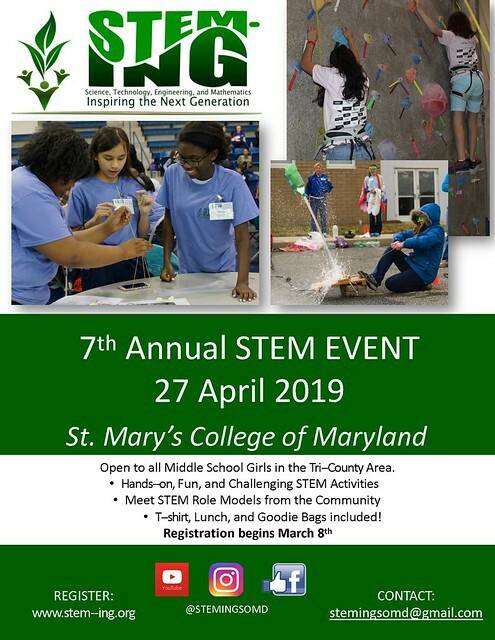 STEM-ING is organizing a one day STEM event dedicated to promoting middle school girls’ interest in STEM and encouraging them to pursue STEM education and careers. Here is your chance to help, plan, and design the event, as well as be an inspirational role model and mentor to the youth in our area! We have many great opportunities for you to get involved that can be tailored to your time availability and interests. All event-day volunteers will receive a free lunch and a t-shirt to be worn during the day of the event! Sign up to volunteer online or email stemingsomd@gmail.com for more information. Want to see more girls in STEM? STEM-ING provides a unique opportunity for middle school girls to interact with positive STEM role models in the community and learn about the variety of ways STEM can become part of a career through fun and challenging hands-on workshops! To learn more or sign up, contact TPP Finance Director MaryKay Myers (301-866-4096, marykay.myers@paxpartnership.org) or STEM-ING Lead Theresa Shafer (703-725-9349, theresa.shafer@navy.mil).